AgileDelta's Mobile Information Client (MIC) drastically reduces the time, cost and skill set required to develop highly interactive mobile applications. In addition, MIC enables enterprises to radically reduce the cost of deploying mobile solutions by squeezing tablet and PDA sized applications into low cost, mass market devices, such as mobile phones. MIC gives Independent Software Vendors and Systems Integrators a competitive edge by enabling them to pack more application features into more devices. First generation mobile applications were fraught with disappointments. Sluggish, browser-based applications on devices with tiny black and white displays were frustrating to use over high latency, dial-up wireless networks. When network or server access was unavailable or intermittent, the applications failed to work. Figure 1 depicts the early mobile application architecture. All critical application data, business logic and user interface logic were placed on the server. Consequently, the responsiveness and availability of each user request was entirely dependent on network and server availability. MIC addresses these problems by enabling a new class of highly interactive applications on internet-connected, programmable devices that have local data storage and often larger color displays and better input devices. MIC applications respond immediately to user requests and continue to work when network access is intermittent or unavailable. Figure 2 depicts the MIC application architecture. 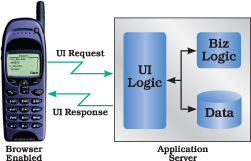 Critical application data, business logic and user interface logic reside on the mobile device. Synchronized data and additional business logic may reside on the application server. The maximum size of an application on most mass market mobile devices is limited to 64 kilobytes or smaller. However, the typical technology stack required to implement XML and web services requires over 20 times that amount of memory. Attempts to build smaller, watered down mobile web service implementations have been problematic. They typically remove features required by a large percentage of web services, making a large amount of internet information inaccessible. They also push complex programming problems up to the developer, making mobile application development more difficult, time consuming and error prone. Although smaller, these implementations still require a disproportionate amount of the mobile device's resources leaving little to no room for application features. The chart below illustrates the amount of memory required for a typical application using a popular mobile web services toolkit called kSOAP and compares it side by side with the amount of memory required by MIC. Where kSOAP leaves just enough room for a very simple demo application, MIC leaves room for a fully featured application. In addition, MIC includes an intuitive binding layer that simplifies and accelerates application development. Unlike other approaches, MIC does not delegate complex programming problems to the software developer or eliminate features required by a large percentage of web services. The most challenging aspect of developing mobile applications is fitting compelling application features into small mobile devices. MIC's patent pending technology shrinks web services applications by orders of magnitude (as small as 8 Kbytes) enabling them to fit on any device while leaving room to spare for compelling features. The resulting applications have more features, run on more devices, are faster and require far less storage, bandwidth and battery life. MIC is a standards based mobile web services implementation that enables mobile applications to interoperate with applications and servers from Microsoft, IBM, BEA, Apache, and others. MIC's unique technology allows users to access more web services from more devices than any other approach.